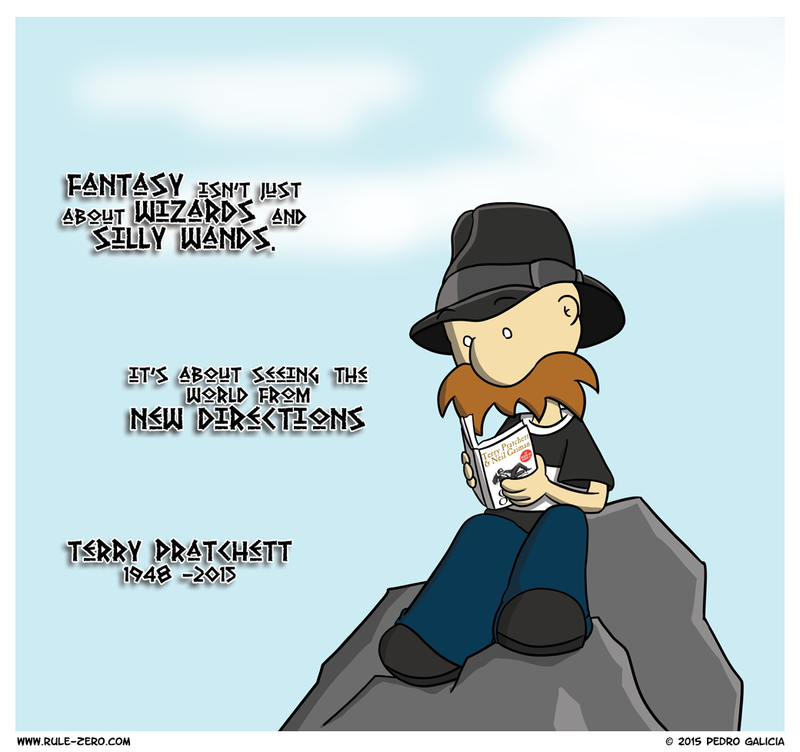 I had a different comic all drawn up, but with the passing of Pratchett, I had to do something different. Terry was a fierce advocate of Fantasy. He defended the Fantasy genre against those who said that it wasn’t legitimate or that it wasn’t “real” literature. There were a dozen quotes I considered using regarding death. One of Terry’s best characters was Death, after all, so there’s plenty of material to draw from. Fantasy is about more than dragons, labyrinths, treasure hoards and spells. It’s about constantly seeing the world again for the first time. It’s about overcoming insurmountable odds and seeing magic wherever you look. It’s about people who come from nothing and save everything. No one’s excluded in Fantasy. At least not for long. It’s about truth through the lens of fiction. The news of Terry’s passing hit me harder than I thought it would. I couldn’t help but smile, however, when I came across one of his quotes. After reading it, I sighed in relief, like a bit of weight had been lifted, and it’s something I’m going to keep with me from now on.